How to choose your bridesmaids: a handy point system for brides! Now that you're engaged, you're going to have to figure out which of your family members and friends will be standing up with you on your wedding day. But choosing your bridal party is no easy task! Between your high school and college friends, cousins, sisters, fiancé's siblings and other significant leading ladies, there's only room for a few of them in the bridal party. So what to do? 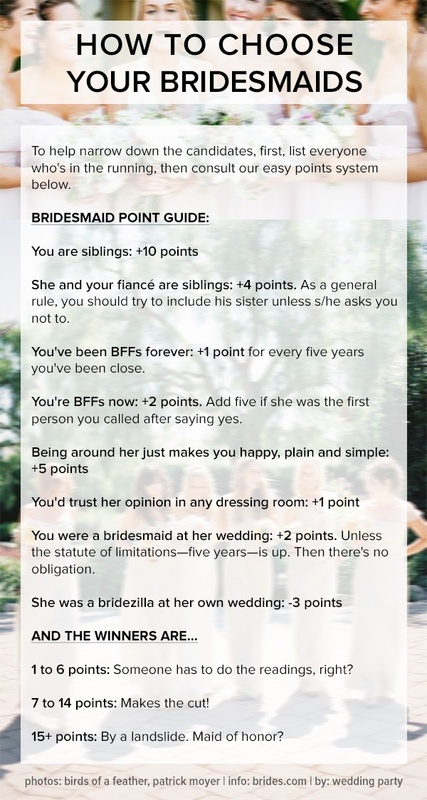 Have you tried this point system, brides? Is it totally helpful or incredibly silly? Let us know in the comments, and tell us how you chose your own bridesmaids!